Editor’s Note: This article is part two of Thrillist Memphis's year-end look at the best of our city’s local food and drink scene in 2016. In addition to our annual Best New Restaurants award, this year, we’re spotlighting the men and women behind the dishes we love to tell you to eat. Our Memphis chef of the year bucked traditions by not only making us want to eat sushi from a food truck, but convincing us it's the best sushi in town. You can also check out our picks for the rest of America’s 2016 Best Chefs, and then catch up on Best New Restaurants. Memphis has a loaded roster of heavy hitters when it comes to fine dining. Andrew Ticer & Michael Hudman expanded their three restaurant empire on Brookhaven Circle and just recently opened Catherine & Mary’s in the Chisca Downtown. And we all know that Kelly English’s two restaurants, The Second Line & Restaurant Iris, are sure bets whether you are in the mood for an oyster stuffed steak or a shrimp po-boy (when would you not be in the mood for that?). Ben Smith has been holding down the fort in Cooper-Young for an incredible 18 years with his Pacific Rim gem, Tsunami. And the one and only Erling Jensen just celebrated his 20th year at his namesake restaurant out east. However, in 2016, the chef who most inspired us is Jimmy Sinh, better known as Sushi Jimmi. Earning himself the title of Thrillist Memphis's Chef of the Year, he convinced us that it was fine (and smart) to eat sushi from a food truck. He showed us what fusion food is meant to be. And now, he’s days away from opening his first restaurant in Midtown. The fact that he’s incredibly nice doesn’t hurt. He’s always got a smile on his face, and he absolutely loves his customers. Recently, he took some time out from his very busy, trying-to-open-a-restaurant schedule to answer a few questions and tell us what he has planned for the future. Sushi can be served on a truck and mine is a lot fresher than some restaurants. Jimmy Sinh: My mom wanted me to learn to cook at an early age so I wouldn't have to depend on anyone to eat. Even if there were just carrots or greens, we would make something good out of it and not have to struggle. I've always been challenged by mom -- she taught me to survive, to cook, and how to grow vegetables. My mom is Chinese and my dad is Chinese and Vietnamese. My parents met after the war in Vietnam, and then moved to the United States after they were married. I started my own family and wasn't making much money working two jobs (I have four boys). My friends told me I should start a food truck, but I was more of a sushi bar type of chef, and I preferred fine dining. But I realized I needed to get out of the restaurant I was at and start something for myself. So, I took my friends’ advice. I looked at an actual food truck and realized it was really nice. I always thought they were nasty, but actually they are a lot nicer than some kitchens. Now we are a rolling sushi bar. I’d been doing sushi since I was 18. My first restaurant job was at Benihana as a host. There I fell in love with Japanese cuisine -- everything has to look good and taste good. What I like best about the culinary world is the art. When I started my own truck I put my own twist on the menu -- my fusion. That’s how I grew up. My dad struggled to feed us seven kids, so we just mixed everything we could from the grocery stores. I grew up in L.A. with a lot of Hispanics and Asians. My cuisine is a mix of both (i.e. Japanese tacos, kimchi quesadillas). I’m used to using leftovers. I can saute them together and easily mix into a meal. My mom gave me a lot of ideas. Now, I could walk into anyone's kitchen and adapt to what they do. I can't have a day off without cooking. It’s just something I love doing. I tell my customers I love what I do. The first thing I do when I wake up in the morning is sharpen my knife, and I'm ready to go. When I make something good and it makes someone happy, then it makes me happy. I grew up poor without a lot of happiness. The first thing I do when I wake up in the morning is sharpen my knife. 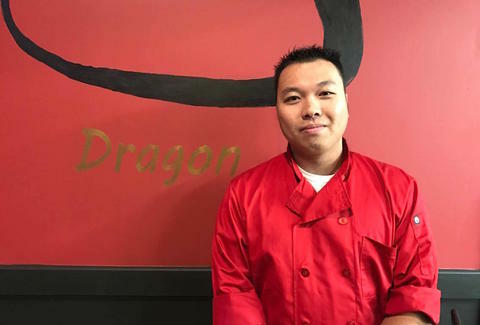 Sinh: My first job was as host at Benihana. It was so messed up there because they only allowed the Hispanics to make sushi. They wouldn't allow me to learn because I was young and the only Asian guy behind the bar. They made me do the dirty work. Eventually I could make basic rolls like spicy tuna and California, but I did more cleaning and dishes than sushi work. I learned by watching. I adapt very quick thanks again to my mom, who would cook and make me taste and then answer her questions -- 'what's in it?? How did I cook it?' Then she would explain it all. That's why I can do it today. I worked at a couple other restaurants. I was a waiter and got to do a little bit of sushi at Nagasaki, but their sushi isn't big. It’s more hibachi. Then I worked at Wasabi (which has since closed) for a few years. I learned a lot and got to be head chef and manager. So, how were able to serve raw fish from a truck? Sinh: The Health Department gave me hell! It took five times to pass. They didn't want me to open. They didn't believe sushi should be served on a truck. Whatever fish we prep that day we sell. We don't keep any fish overnight. That's why I always sell out. People were hesitant at first, but now everyone is following me. They realize sushi can be served on a truck and mine is a lot fresher than some restaurants. The truck is chef-owned, not boss-owned. I care about my customers first. The money comes later. Sinh: The biggest hit right now is the spicy crawfish nachos. I got the idea from a truck on the west coast. I saw a picture and put my twist on it. I use Nacho Doritos, spicy crawfish, pico de gallo, spicy mayo & Sriracha. I try to focus on clean eating so my customers don't feel bloated or tired when they go back to the office. Also popular is the sushi burrito -- we brought it to Memphis from west coast. Again, I never ate one before. I just made it my own way. Out west they use more veggies. I believe in more protein… snow crab, yellowtail, etc. Ours comes just as big as a burrito and is meant to be hand held. I serve it with spicy mayo on the side to complement. My homemade kimchi fries are a big hit. A friend from Dallas asked me to add it. He just told me what was in it. I use seasoned fries, they have more flavor, stay crispier. I add real ground beef (90% beef, 10% fat) and my homemade kimchi. I add tomato, cilantro, spicy mayo, Sriracha, and an egg sunny side up. Growing up, we always got egg with dinner. The yoke adds flavor and protein too. What made you decide to open a restaurant? How will it be different than the truck? Sinh: I never thought I would come this far this fast. I told my customers I wanted a restaurant by the end of the year and it came true. I never thought I'd pull it off. I just went to bank and they approved it. I was shocked. I was ready for a brick and mortar to show what real food tastes like when you put love into it. We can store more things at a restaurant and keep things fresher. Also we are staying open until midnight on weekends so people can eat well late at night. We’re going to have table service. There’s a drive through window so to go orders can be picked up and during winter and summer customers can stay in the car. Then you can have dogs, a baby in back seat, etc. and we'll hand it to you. We’ll have more platter combos, so you can bring them home and feed whole family. I want to make it convenient. And we’ll do any kind of catering -- parties, weddings -- nothing too small or large. I’ll add on bento boxes with rice, meat, pork belly, secret sauce and a salad on side. There will be special drinks, like a sake martini. I have a little bartending background and love mixing drinks as much as cooking. We’ll also sell wine and beer. What made you choose this location? (The old Wendy’s across from the Main Library, 2895 Poplar). Sinh: I got lucky. I’ve been looking at this spot for a year. I bumped into one of my old bosses at the warehouse where we get our food. Turns out he had bought the old Wendy's. He didn’t want the building, just the land. He leased it to me. I looked at so many places and found nothing better. The kitchen is large and the way I want it and there’s a great parking lot. And when will the restaurant open? Sinh: I really thought I would be open in October, and then December, but now it looks like early January. We are going through inspections. We’ve had vent and hood problems -- it’s the only thing keeping me from opening right now. Everything else is completed. I thought it would be easy, but I had to get all new equipment. It took a month to clean the kitchen. I had to renovate -- everything inside is brand new. Only the racks were usable. I had to build rather than take over, but I built to my specs and I love it. Everything you see is all about me. A lot of credit to goes to my mom & my sister. I wouldn't be where I am without them. What will happen to your truck? Sinh: I'll keep truck going, but put it down for 3 months for maintenance. I also need to build my banh mi truck. By spring both trucks will operate together unless booked for a special event. Whoa, wait… a banh mi truck is in the works? Sinh: I’m calling it Bahn Mi Brothers or Bahn Mi David for my brother, who is part owner. We’ll serve all banh mi, fresh spring rolls, Vietnamese coffee, Thai tea, sodas, and waters. It will be simple. Come up and pay a couple of dollars for a coffee and sandwich. Everyone else who does bahn mi or pho isn’t that good. I want to do my mom's recipes. Sinh: My goal is to open a second location in downtown Nashville. I used to go every weekend. I could never find good Asian food. I haven't found good sushi or Vietnamese there. We'd do good there. Finally, what’s your advice to other chefs in Memphis right now? Sinh: Don't do something just because you see other people doing it. Don't do it for the money. Do it for what you love. If you are good at something, do it for that. I never went to college. I didn't get paid well at first. I was in debt, but followed my dream. A lot of credit to goes to my mom and my sister. They helped me realize my dream. I wouldn't be where I am now without them. Stacey Greenberg lives in Memphis with her two sons. She is the author of the award winning blog, http://DiningwithMonkeys.com. She's been a fan of Sushi Jimmi since day one.